Last week the Austin city Council voted to honor indigenous peoples day instead of Columbus Day on the second Monday in October. Equilibrio brought this resolution forward through councilwoman Ora Houston, and we’re pleased to see and 9-1-1 vote in favor of this historic change on the dais. 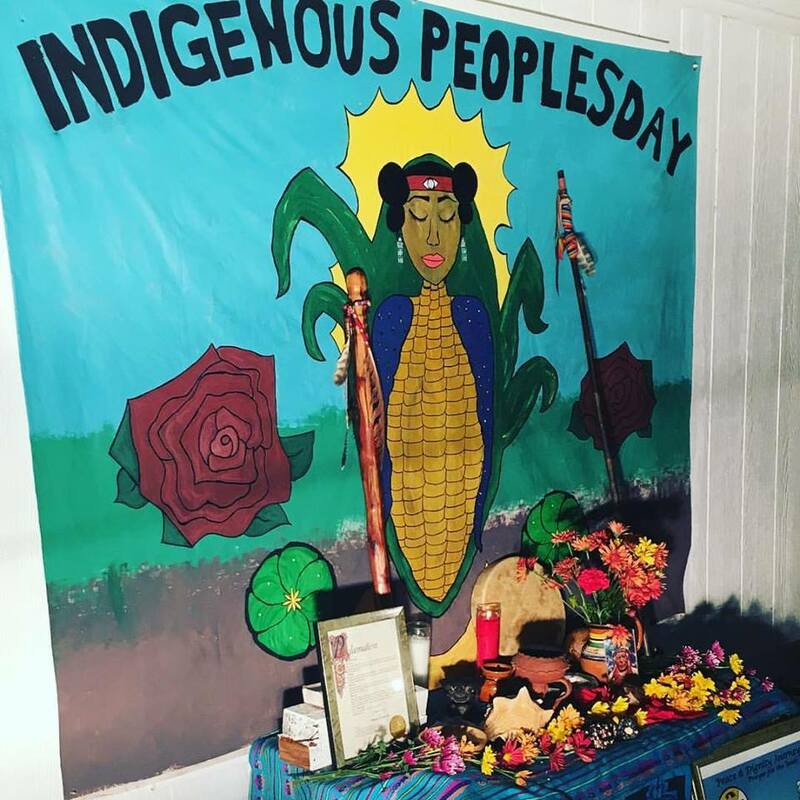 We were proud to host an official Indigenous Peoples Day celebration on Monday alongside Alma de Mujer, PODER, Resistencia and ATX-EJ. Thank you to everyone who attended, helped out and supported. Marking Indigenous People Day instead of Columbus Day is more significant now than ever. Not just because we must honor the legacy of the thousands of years of history and culture of these lands. Neither is it merely to stop honoring the violence and brutality of this nation’s origins. Indigenous Peoples Day is not about the past – it is about the present. Celebrating Indigenous Peoples Day is about our need to address the ongoing displacement of the natives of East Austin due to gentrification; it is about our need to confront the desecration of Native burial Sites in places like Eagle Pass and South Padre Island where multinational corporations build coal mines and fracked-gas export facilities on our sacred lands; it is about allowing the human right to migration to continue unabated by the militarized state, as we Native peoples have migrated across these artificial borders for thousands of years. Indigenous peoples day too, is about the future. Is about future of this country and the future of this land and its people. How will we live 10 years from now or 100? What are the guiding values of this City, of this region, of these rivers? Will we honor the displacement symbolized by Columbus and propagated by our current economic and political system, or will we honor the land, ancestors and relations that hold us? We are in time when statues are being taken down, names are being changed, and public officials attempt to right the wrongs of the past. Parts of this history are obscure: an elementary school named after a little-known confederate General, a dorm named after a grand Wizard of the KKK or one to many statues subtly erected in the past, and even more subtly taken down in the present. However, this history barely scratches the surface of our understanding or ability to confront the colonial, exploitative legacy of this place. This place we call Austin – named after a slaveholder for sure, but not just a slaveholder. It was Stephen F. Austin who first proposed granting settlers land for every slave brought into Texas, creatively expanding both the displacement of indigenous people and the dehumanization of displaced Africans in a single policy. But more than his deeds or actions in the past, we must focus on the legacy of these laws and the distribution of these lands. The foundation of our current system is embedded within this history. The effects are not merely psychological wounds carried by our people, or ideological frames that can shift with the proper education or training. The true effects are material. Poverty and injustice still plague the descendants of the displaced – too the bloated wealth of land and resources still rests in the hands of a corrupt oligarchy. The political and economic system in Texas remains hyper colonial in its ongoing exploitation of land and people. Moreover, every time any of us claim this place beneath our feet, we have to honor the name of a white man. What White man do you come from? If not by blood then by designation of this place with that name, and of this land with that system. And this is just one name, but there are many more. Lamar – one of the longest roads in our city – is the name of a genocidal tyrant. However to erase the legacy of the boulevard in our city, by changing the name, would not challenge the unequal power held by the descendants of Lamar, and those like him – the racist lawmakers, exploitative landholders and unaccountable cronies who run this state. It is the cradle of bathroom laws, SB4 and the border wall, it is white supremacy that we need to be rid of, and this is more than a name. It is beyond names where we are headed. Not a retrenchment of identity based categories, but a unifying appreciation for the different ways of knowing and connecting to earth. The outlier is capitalism – the poison all people are forced to drink. The antidote is our cultures – it is rooted in land. The antidote is decolonial. The antidote is indigenous. We celebrate the rise in consciousness as we create systems of justice and equilibrium. Just as 500 years ago there was no concept of “indigenous” in the modern sense, we can imagine that 500 years from now the term will have no meaning. The present moment marks the center of the colonial struggle. We are now passing through the eye of the storm and the still of the still of the eclipse. This marks the pivot of the long dure’ of history. From here on forward we should think of all we create as decolonial and this land as indigenous territory.